Brilliance. Desperately looking forward to fall myself. I have had mine for over 15 years. You can wear them straight through muck season. I love what the signature collection had to offer for summer/spring and I am especially loving fall. I own two pair of Red Wings (which is ridiculous since one will last a lifetime), but Bean Boots are better for treading the city slush. A must have. My pair arrived in the mail Monday and I’m trying to rock them already! I saw these in the catalog the other day. I’m still not sure what I think about the black and brown combo. I’ve got too many pairs of these already, mostly for light duty dog-walking or for rainy days. For real outdoor or inclement weather use, I prefer Schnee’s (with ADV soles) or, my new favorites, White’s Snow Cats. I have the same pair of bean boots since 1985 or ’86. I had the bottom part replaced once. They are the super tall ones, like 16″ I dont know if you can even get them that tall anymore. Not my favorite boot to be honest. My socks (gasp! socks?) do weird things in them and it’s not pleasant. And terrible boots for cold weather. My favorite winter boot: Whites Snow Cats. I’ve had a pair for 2 winters and they are awesome. I’ve had the medium height chocolate leather since 95 and I need to have them resoled. I rotate between the hunting boot and blundstones. I like the Alex Carleton version of the Hunting with Wax Canvas. Last year I ordered a pair of the bison hide bean boots and replaced the standard laces with red laces. I can’t be more pleased and actually find myself wishing for inclement weather so I can wear them more. the boots are iconic, but completely useless. walk around in a snowstorm in these and you’ll be screaming for a pair of sorrels. find yourself in one of those great pools of icy water that lurk at every nyc intersection right after and in between snowstorms, repeat scream, add expletives. tortillas have better cushioning than these boots. i digress, perfect boot for dithering about, light rain, trips to farmers market/flea markets, posing as landed ny/ct gentry and great props for a photo shoot. The best part of fall in the north east to me, yes even beats out tweed jackets, is just the smell of the leaves at night. ML’s set the right course correction here. 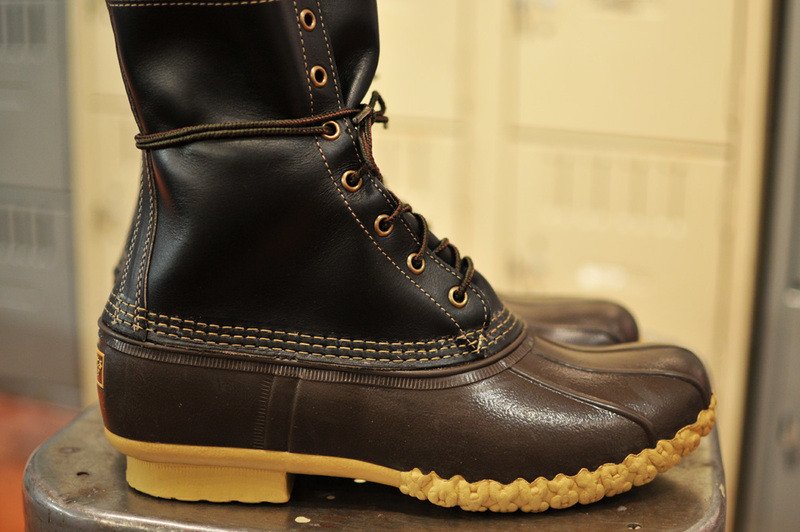 The Maine Hunting Boot is the real heavyweight in the Bean Boot department. I’m all for them making an ACL limited “Black Out” line for you. 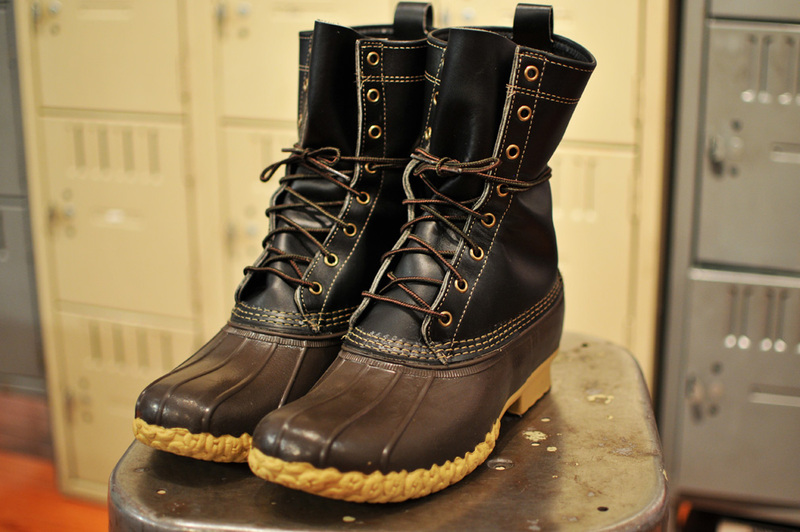 I’d pay big for All Black Bean Boots. Just saying. The lacing is similar (but distinctly different) from the lacing and end “knotting” of Blucher mocs that are also done for those shoes (on request) when they are purchased in Freeport. And again, if you are in the main store (not the factory stor) and ask the (correct) clerk politely, they do still arrange for your shoes/boots to be sent down the road to the factory and have someone who worked on them/sewed them sign the inside of the tongue and you can pick them up in two days. 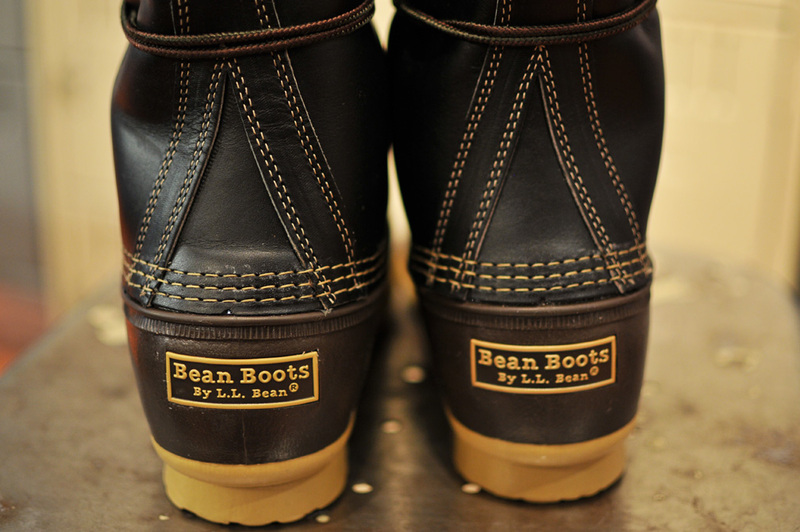 And of course the heel label must say “Maine Hunting Shoe” not “Bean Boot”! Did you make that whole story up or are you being for real??? I think they look pretty nice in black, the canvas look great as well. These are are wicked awesome. Unfortunately I know brooklynites will be wearing these in mid september because its “getting chilly”. Hopefully that won’t detract too much from the style and allow me to wear these in Boulder, CO during our winters where theres actual snow on the ground 3-4 months a year. Buying these boots in NYC is like buying a Land Rover to pick up the groceries (unless your market is 20 miles of snow packed road away). These boots are simply the best — I grew up in VT and this was all my family rocked.